The Goot Pot-28C is a compact and lightweight lead-free solder pot with temperature range from 270°C to 500°C. It combines sophistication and high efficiency in a compact design, promising excellence in soldering work for the lead-free generation. Goot Pot-28C Solder Pot has a Spatula included. 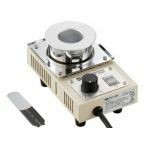 Purchase a Goot Pot-28C Solder Pot sold by Howard Electronics Today!